In Noam Chomsky’s much anticipated first appearance at the Left Forum (the U.S.’s premiere gathering of leftists and progressives held each spring in NYC), he delivered the closing plenary speech to an overflow crowd. 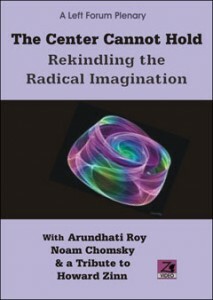 The title of the closing plenary, and the theme of the entire three-day 2010 Left Forum, was “The Center Cannot Hold: Rekindling the Radical Imagination.” The plenary began with a tribute to Howard Zinn by Frances Fox Piven. As part of that tribute, actor Brian Jones performed an excerpt from Zinn’s play “Marx in Soho.” The tribute was followed by some brief remarks from Arundhati Roy about the effect of U.S. policies on India and Pakistan. Noam Chomsky then closed the program with an hour-long talk on the state of the “center” in relation to U.S. foreign and economic policies, and the possibility of rekindling the radical imagination. He sees signs of hope, but warns of chilling parallels between the current situation in the U.S. (and other parts of the world) to conditions before the rise of Nazism in Germany in the 1930. Recorded March 21, 2010; 83 minutes.